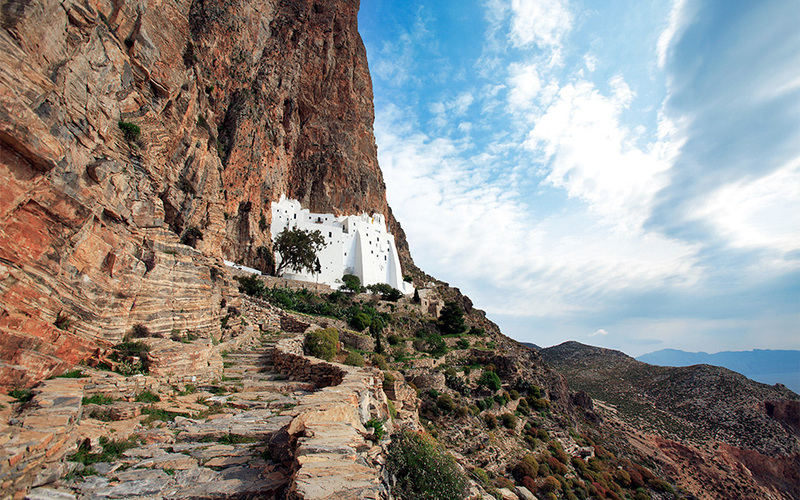 In the spring, a network of trails makes for incredible walks on Amorgos. Dramatic landscapes covered in wildflowers are set against the blue of the Aegean. It is worth climbing the 300 steps that lead you to one of the most impressive monasteries in Greece. The Byzantine Monastery of Hozoviotissa is spread over 8 levels with a total height of 40m. The impressive structure is Amorgos’s most iconic sight. Also belonging administratively to the Hozoviotissa Monastery is the Ai Giorgis Valsamitis located a few kilometers outside Chora. The church here is worth a visit, built on a spring that once formed the basis of an ancient ‘water oracle’ of Apollo. Amorgos’s Chora (or main village) is one of the most beautiful in the Cyclades, built in such way so as to be not visible from the sea as a form of protection from pirates. 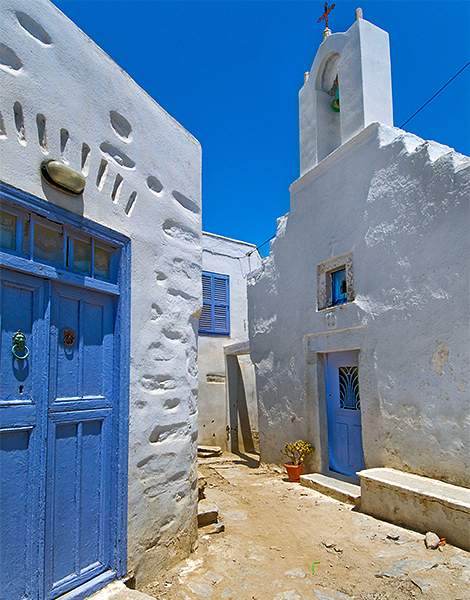 Countless churches, charming cafes, winding small flagstone streets, and the characteristic Cycladic white and blue homes add to its picture-perfect charm. 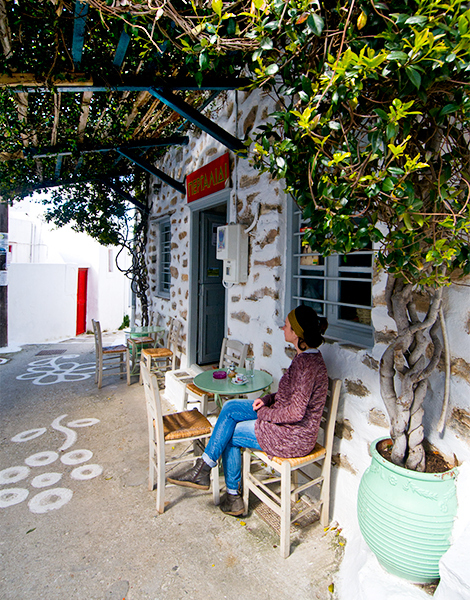 During summer, the area around Aegiali on the northern end of the island is famous for its beaches, but in spring it is ideal for a walk through the villages. Stroll through Tholaria, Langada and Potamos, the three unbelievably relaxed villages of Aegiali with whitewashed houses and typically narrow streets. Amorgos features a rich network of trails offering you the opportunity to experience the island and its landscapes by foot rather than by car. Before setting off however ask for information about the state of the trails you are planning to take (ie whether they have been recently cleared and marked). Do not leave without trying psimeni (roasted) raki, the grape-based alcoholic drink flavoured with mountain herbs. The island has a wide variety of aromatic plants growing wild such as oregano and thyme, that you can either pick yourself while hiking or purchase from many village shops for a few euros. On Good Friday, the streets of the Chora and other villages are strewn with freshly-cut stems, leaves and flowers of sage and oregano filling the air with their heady fragrances. The procession of the Epitaphios takes place among countless small fires lit in clay pots casting light and shadows along the narrow streets. The following morning, try lazarakia, the small sweet, figurine-shaped buns. On Easter Sunday join the procession of the icons of the Panaghia Hozoviotissa monastery through the streets. You can reach Amorgos by boat from the port of Piraeus (8 hours, 72 euros return). • Aegialis Hotel & Spa, Aegiali, tel. (+30) 2285073393. Five-star accommodation with a variety of rooms, suites, as well as a thalassotherapy and beauty center. From 99 euros. • Lakki Village, Aegiali, tel. (+30) 2285073253. Family hotel with a restaurant and activities for children over 4 years old. From 45 euros. • Aelia Studios, Aegiali, tel. (+30) 2285073188. Rooms in pastel colors and numerous facilities. From 40 euros. • Nikos, Langada, tel. (+30) 2285073310. For special Easter dishes and the local game “Empilioi” played right in front of the restaurant. • Panorama Tholaria, tel. (+30) 2285073349. Spit roast and unique, local, organic wine accompanied by the exclusive jokes of Mr Nikolas and live music.